Chest X-ray. X-rays may show abnormalities if you have pleural mesothelioma. Chest or abdominal CT scan. Computerized tomography (CT) may reveal abnormalities in your chest or abdomen if you have mesothelioma. It's not uncommon for mesothelioma to be misdiagnosed initially because mesothelioma is rare and its signs and symptoms aren't specific. Your doctor will likely rule out other more common conditions before considering mesothelioma. Biopsy, a surgical procedure to remove a small portion of the mesothelium for laboratory examination, is the only way to determine whether you have mesothelioma. Thoracoscopy. Thoracoscopy allows the surgeon to see inside your chest. In this procedure, the surgeon makes one or more small incisions between your ribs. He or she inserts a tube with a tiny video camera to see inside your chest cavity â€” a procedure sometimes called video-assisted thoracoscopic surgery (VATS). Special surgical tools allow your surgeon to cut away a piece of tissue. Laparoscopy. Laparoscopy allows the surgeon to see inside your abdomen. Using one or more incisions into your abdomen, the surgeon inserts a tiny camera and special surgical tools to obtain a small piece of tissue for examination. Thoracotomy. Thoracotomy is surgery to open your chest to allow a surgeon to check for signs of disease. He or she removes a sample of tissue for testing. Laparotomy. Laparotomy is surgery to open your abdomen to allow a surgeon to check for signs of disease. He or she removes a sample of tissue for testing. Once the tissue sample has been collected through biopsy, the sample is analyzed under a microscope. This determines whether or not the abnormal tissue is mesothelioma. Biopsy samples also allow your doctor to test for the type of cells involved in your mesothelioma. 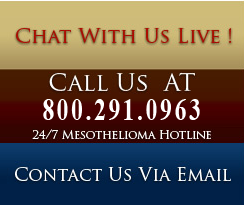 The type of mesothelioma you have is used to determine your treatment plan. Other screening methods for diagnosis of asbestos-related disease include various imaging tests. In addition to X-rays, methods include magnetic resonance imaging (MRI) or positron emission tomography (PET). A more recent and promising screening method is the computed tomography (CT) scan.